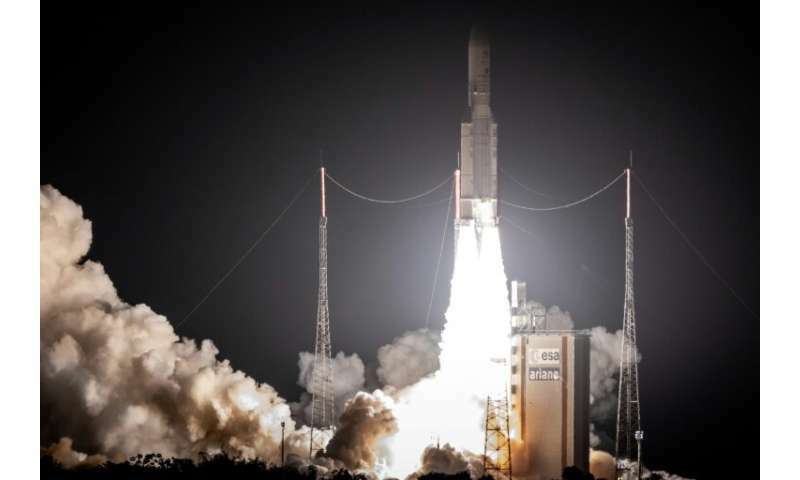 Two communications satellites—for India and a consortium from Saudi Arabia, Greece and Cyprus—were successfully put into orbit by the European aerospace firm ArianeGroup, the company announced. Competition by commercial operators in the lucrative rocket industry has intensified in the past few years, particularly since the launch of Elon Musk's re-usable SpaceX. An Ariane 5 rocket with a payload of nine tonnes lifted off from the Kourou space centre in French Guiana late Tuesday, the first of five launches scheduled for this year, ArianeGroup said. One satellite, belonging to a Saudi governmental scientific body and the Greco-Cypriot operator Hellas Sat, is to supply television, internet and telephone communications for the Middle East, South Africa and Europe for the next 15 years. The other is a communications satellite designed and built by the Indian Space Research Organisation. "This first launch of 2019 demonstrates once again our capacity to perfectly adapt the Ariane 5 launcher to answer the needs of each client," said ArianeGroup executive president André-Hubert Roussel. Ariane 5 rockets are to be replaced in 2020 by the Ariane 6, which will be an estimated 40 percent cheaper. Still, the ArianeGroup announced in November it would cut 2,300 jobs by 2022 as the development of the new rocket nears its end and orders for new launches have slipped in the face of competition.